The Beer Lineup: Pyramid Apricot, Crispin Cider, Dogfish Head 90 Minute, Dogfish Palo Santo Marron, Dogfish Head Punkin, Magic Hat Hex, Racer 5, Smuttynose Old Brown, Duck Rabbit Milk Stout, Southern Tier Cremebrulee, Southern Tier Harvest, Highland Gaelic Ale, Highland Oktoberfest, Highland Kashmir, Lagunitas Ipa , Lagunitas Sumpin, Oskar Deviant Dales, RJ Rockers Bell Ringer, RJ Rockers Pumpkin, Rogue Jon Jon, Rogue Good Chit, Terrapin Pumpkin, Terrapin Samurai Krunkles, Terrapin Monk’s, Thomas Creek Red Ale, New Holland Poet, New Holland Dragon Milk, New South Brown, Sam Adams Lager, Sam Adams Octoberfest, Sam Adams Angry Orchard, North Coast Old Rasputin. Thanks to Crown Beverages, Yahnis, Highway 15, RJ Rockers, Terrapin, Southern Hops, and Sam Adams for working with us on this event. 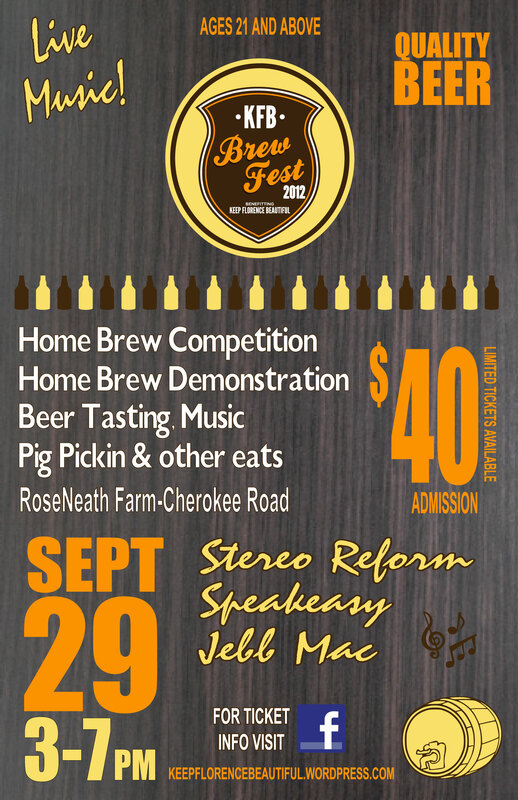 The Second Annual KFB Brew Fest benefiting Keep Florence Beautiful will be held this year on September 29th, 2012 in Florence at Roseneath Farm on Cherokee Road. Ticket sales are limited, non-alcohol tickets are for sale for persons 21 and over that plan to attend the event but not partake in the Beer Tasting. Buy your tickets using the links at the top of this article and join us during this wonderful event for a good cause! After we pay for the venue, bands, food, and materials for the event profits from the purchase of your ticket goes toward upcoming KFB projects and initiatives, learn more about Keep Florence Beautiful. Also, please share this with your friends by downloading and printing the flyer. Contact us at kfbboard@keepflorencebeautiful.org if you have any questions or if you would like to get involved! We’ve got it on our Nonprofit Event Calendar on Pee Dee Foodie. Wishing we could be there, but right now we’re scheduled to be out of town on that day. Best wishes & Have a great time!